Having taken away the Range Rover SV Coupe with one hand, Land Rover have given the Range Rover Velar SVAutobiography Dynamic Edition with the other. Smaller in scale than the SV Coupe, but just as interesting, the Velar will be priced significantly lower, starting at £86,120 OTR in the UK. The Velar SVAutobiography Dynamic Edition has been developed by Land Rover’s Special Vehicle Operations. This is Land Rover’s bespoke department. At its heart, sits the supercharged 5.0 litre V8. It is the first time this engine has been placed into the Velar. It has 550 hp. As a result, it is capable of a 0-100 km/h blast in 4.5 seconds (0-60 mph in 4.3 seconds) and a top speed of around 274 km/h (170 mph). The work carried out on the Range Rover Velar SVAutobiography Dynamic Edition is said to be extensive. 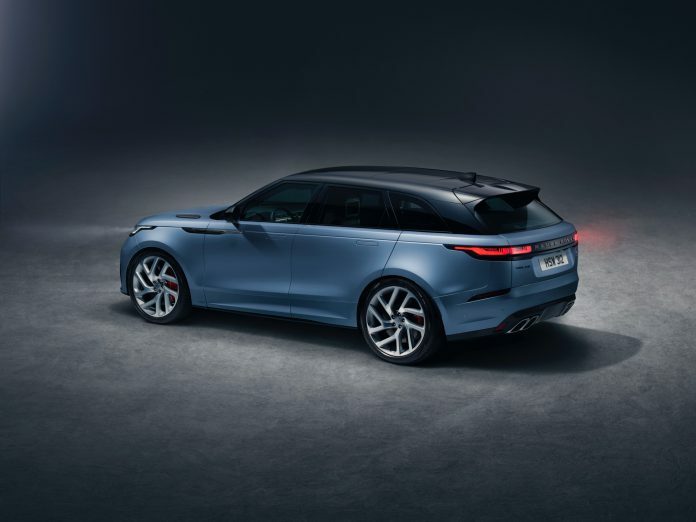 As a result, the Velar carried uprated brakes and suspension components as well as bespoke settings for everything from the powertrain to the safety systems. There is an upgraded anti-roll bar to reduce body roll and a reworked all wheel drive system to cope with the new power. The new exhaust system sheds 7.1 kg of weight and unleashes a distinctive growl thanks to active elements. The Range Rover Velar SVAutobiography Dynamic Edition gets a new front bumper with larger air intakes, a new grille and lower side mouldings, a revised rear bumper, new quad exhaust finishers and a new transmission tunnel undertray. The changes are help the Velar cut through the air more efficiently. The Range Rover lettering on the bonnet and tailgate get a knurled finish on the metal element. The Range Rover Velar SVAutobiography Dynamic Edition is also the only Velar available in Satin Byron Blue. As standard, all models will get a contrasting Narvik Black roof. If Satin Byron Blue is not your thing, five other exterior colours are on offer: Firenze Red; Santorini Black; Corris Grey; Fuji White and Indus Silver. Two wheel options are available. The standard 21-inch rims weigh as much as the 20-inch versions offered with the standard Velar. A set of 22-inch rims, which include a unique Silver Sparkle finish, can also be ordered. 395mm front and 396mm diameter rear brake callipers are also on offer. Inside, twin-stitched, perforated and quilted Windsor leather is unique to the Velar SVAutobiography Dynamic Edition. Four leather colour combinations are on offer with Ebony, Cirrus, Vintage Tan and Pimento leather. 20-way adjustable heated and cooled front seats with memory and massage functions are included as standard with a new sport steering wheel, aluminium gear shift paddles and an optional carbon fibre pack. Competition? Logically, the Porsche Macan Turbo is about as close as it gets at this size. The Mercedes-AMG GLC 63 and Jaguar F-Type SVR also look very attractive. Which one would you go for? 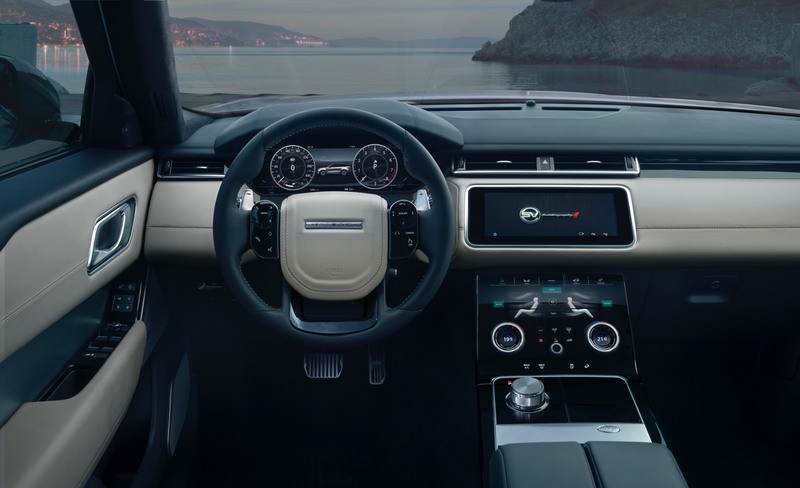 Does the Range Rover Velar SVAutobiography Dynamic Edition hit the right buttons for you?